Until a few weeks ago, the term EcoTherapy hadn't crossed my path. However the practice of EcoTherapy has been with me for a long, long time. It's the main reason I promote Nature Journaling! Get out into Nature as much as you can and sketch, make notes, paint and observe the wonder of Nature. You will bring a balance into your life that will refresh and renew your spirit. I keep a journal just for my birdwatching. It sits on the kitchen table or counter along with binoculars, Sibley bird guide, mini palette, waterbrush, pencil, pen and micron pen. Pictured here is my new mini palette that is the size of a business card case. I purchased it from Maria Coryell-Martin of Expeditionary Art. I'm using limited palette colors by M. Graham that include: Hansa Yellow, Azo Yellow, Quin. Rose, Naphthol Red, Anthraquinone Blue, Ultramarine Blue, Quin. Rust, Nickel Azo Yellow and Sap Green. 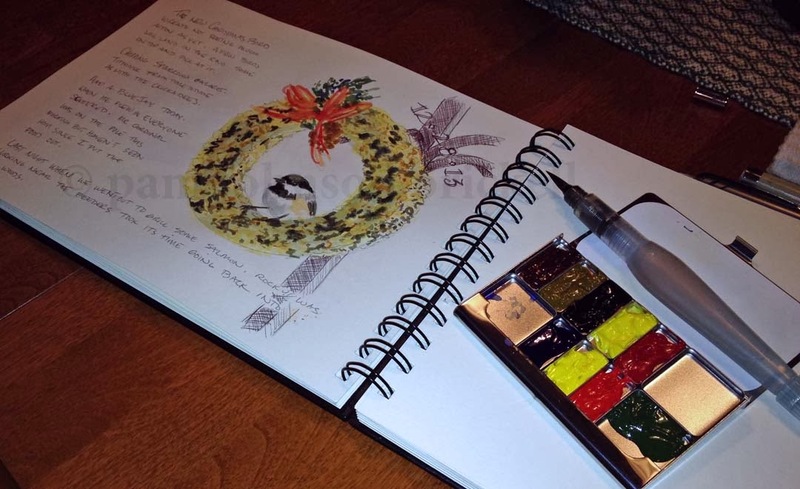 The journal is a Stillman and Birn, Gamma (100# ivory paper) - just delicious to work in! How do you get your EcoTherapy? Like you, Pam, I love watching the birds at the feeders - often picking up my guide to identify a new one coming in for a visit. We have a list of those we've seen and the year's we've seen them and I keep the suet and seed feeders full for them all year round. Our bluejays are back and I saw the first robin today!! Does he think it's spring already because we've had temps in the 50's? Or is that an indication that the worst of winter is over already? I hope! For me, nature does inspire and invigorate me when I'm dull, stupid and lazy from all the holiday meals and goodies :) Of course, nothing beats a walk on a warm beach! Rhonda, your comment warms my heart :) The weather has been crazy lately. Hopefully Mr Robin is signaling a milder winter at least! Yesterday afternoon was the perfect day for a beach walk. We did manage to get out on our bikes - mid 70's! More realistic temps today. How are you enjoying your new palette, Pam? I am about to fill my larger inserts as the year ends. And of course Happy New Year to you and yours.